As a fiscal policy economist who believes in individual liberty and personal responsibility, I have two goals. 1. Replace the corrupt and punitive internal revenue code with a simple and fair flat tax that raises necessary revenue in the least-destructive and least-intrusive manner possible. 2. Shrink the size of the federal government so that it only funds the core public goods, such as national defense and rule of law, envisioned by America’s Founding Fathers. Needless to say, I haven’t been doing a great job. The tax code seems to get worse every year, and even though we’ve made some progress in recent years on spending, the long-run outlook is still very grim because there’s hasn’t been genuine entitlement reform. But I continue with my Sisyphean task. And part of my efforts include educating people about the Rahn Curve, which is sort of the spending version of the Laffer Curve. it shows the non-linear relationship between the size of government and economic performance. Simply stated, some government spending presumably enables growth by creating the conditions (such as rule of law and property rights) for commerce. But as politicians learn to buy votes and enhance their power by engaging in redistribution, then government spending is associated with weaker economic performance because of perverse incentives and widespread misallocation of resources. I’ve even shared a number of videos on the topic. The video I narrated explaining the basics of the Rahn Curve, which was produced by the Center for Freedom and Prosperity. A video from the Fraser Institute in Canada that reviews the evidence about the growth-maximizing size of government. A video from the Centre for Policy Studies in the United Kingdom that explores the relationship between prosperity and the size of the public sector. 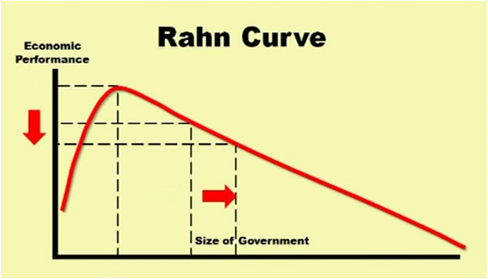 Even a video on the Rahn Curve from a critic who seems to think that I’m a closeted apologist for big government. Now we have another video to add to the collection. The evidence indicates that the optimum size of government, e.g. the share of overall government spending that maximizes economic growth, is no greater than 25% of GDP (at a 95% confidence level) based on data from the OECD countries. In addition, the evidence indicates that the optimum level of government consumption on final goods and services as a share of GDP is 10.4% based on a panel data of 81 countries. However, due to model and data limitations, it is probable that the results are biased upwards, and the “true” optimum government level is even smaller than the existing empirical study indicates. Two points in that excerpt are worth additional attention. First, they understand that not all forms of government spending have equal effects. Spending on core public goods (rule of law, courts, etc) generally are associated with better economic performance. Spending on physical and human capital (infrastructure and education) can be productive, though governments often do a poor job based on a money-to-outcomes basis. Most government spending, though, is for transfers and consumption, and these are areas where the economic effects are overwhelmingly negative. So kudos to the Bulgarians for recognizing that it’s particularly important to restrain some types of outlays. The other point that merits additional emphasis is that the growth-maximizing size of government is probably far lower than 25 percent of economic output. Here’s what they wrote, citing yours truly. …the results from the above mentioned models should not be taken as the “true” optimal level of government due to limitations of the models, and lack of data as already discussed. As Dan Mitchell commented, government spending was about 10% of GDP in the West from the end of the Napoleonic wars to World War I. And we do not have any data to think that growth would have been higher if government was doubled or tripled. However, what the empirical results do show is that the government spending should be much less than is the average of most countries at the moment. Thus, we can confidentially say the optimum size of general government is no bigger than 25% but is likely to be considerably smaller because of the above-mentioned reasons. 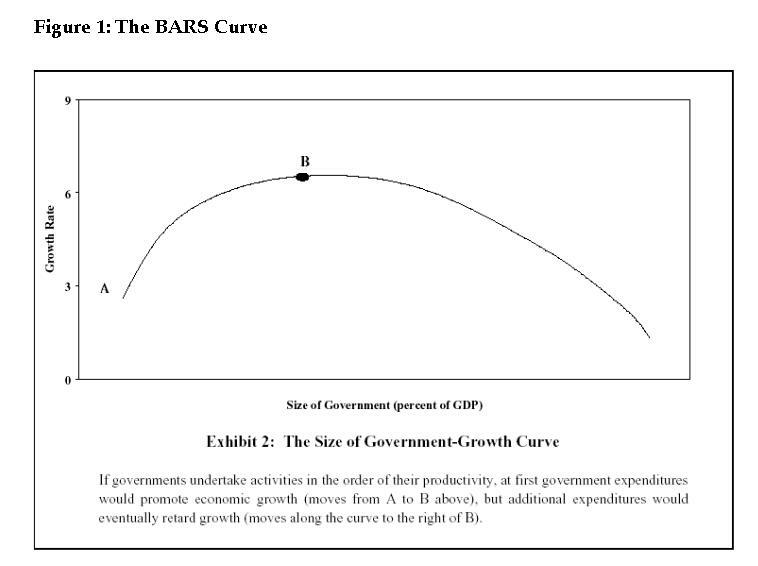 And here’s their version of the Rahn Curve, though I’m not a big fan since it seems to imply that government should consume about one-third of economic output. I much prefer the curve to show the growth-maximizing level under 20 percent of GDP. Though I often use a dashed line to emphasize that we don’t really know the actual peak because there unfortunately are no developed nations with modest-sized public sectors. Even Singapore and Hong Kong have governments that consume about 20 percent of economic output. But maybe if I someday achieve my goal, we’ll have better data. And maybe some day I’ll go back to college and play quarterback for my beloved Georgia Bulldogs. P.S. Since I shared one video, I can’t resist also including this snippet featuring Ronald Reagan talking about libertarianism. What impresses me most about this clip is not that Reagan endorses libertarianism. Instead, notice how he also explains the link between modern statism and fascism. He had a much greater depth of knowledge than even supporters realize. Which also can be seen in this clip of Reagan explaining why the Keynesians were wrong about a return to Depression after World War II. And click here if you simply want to enjoy some classic Reagan clips. For what it’s worth, this clip from his first inauguration is my favorite. Given my man crush on the Gipper, you also won’t be surprised to learn that this is the most encouraging poll I’ve ever seen. First, I want to point out that the Rahn curve is certainly wrong in the dotted-line part under 15-20% of GDP. At 0% of GDP, economic growth might be as bad as -10% as society descends into anarchy/competition between powerful interests/militias. There is also no reason to assume that GDP growth will be substantially lower with government spending at 10% of GDP than 20%. Wasn’t U.S. total government spending close to that for over 100 years while growing rapidly There may be more individual hardship with the government not helping the needy or recently unemployed, but overall GDP might actually grow faster. So the GDP growth curve should be far lower at 0%, shoot up rapidly to about 5%, and then be roughly equal from 5-20%. Second, I really like nedlandp’s idea of both a fair and flat tax. The best thing to do is tax as many things as possible (broad tax base) and tax them at the lowest rate possible. When you tax everything at 10%, it’s generally not enough to dissuade someone from doing something, whereas a big 40% tax on one thing can easily do so. It appears that Rand Paul figured out how to basically do the same thing, but by repealing the payroll tax and keeping most of the welfare state rather than creating a prebate. The downside is his version keeps the welfare state largely in tact, but eliminating it is politically impossible in the real world. You would severely anger tens of millions of people, including all senior citizens. Please read very good take heart don’t dispair . God is still wetching over you . As an economist you’re the best. However, as a political realist you’ve got problems. You cannot waffle between a Flat Tax or the FairTax. You either have to pick one or create a hybrid taking the best parts of each. A Flat Tax is not progressive, so you must add a FairTax style prebate or a standard deduction. While a standard deduction is easier for government, the real cost of our current code is the time and effort to fill out the damn forms. If you go the prebate route, you can eliminate the filing of annual forms for those individuals that don’t own a business. Employers will withhold the accurate tax amount. The best approach is a hybrid Flat/Fair Tax: Earned Income is taxed at a flat rate. Gross salaries and domestically produced components, capital goods, and transportation become a deduction from net sales which are taxed like the FairTax at the same flat rate. No need for a constitutional amendment. The key in selling this program is the size of the prebate. This prebate should go only to adult citizens and replace all welfare and should be deducted dollar for dollar from Entitlements. A prebate cannot be lost by earning income, so it gets rid of the disincentives in current federal welfare and forces every citizen to become personally responsible. A prebate that approaches 100% of the poverty line will not only get rid of financial poverty, but the poverty of dependence. AND, as a bonus it will have the political wings necessary for passage. I find the poll showing Reagan beating Obama by 58% to 42% horribly depressing. There are still people who would vote for Obama?